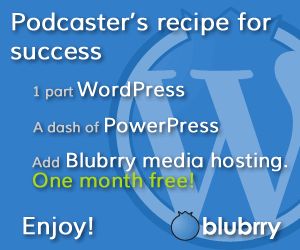 Telestream Wirecast 7.6 is Here! 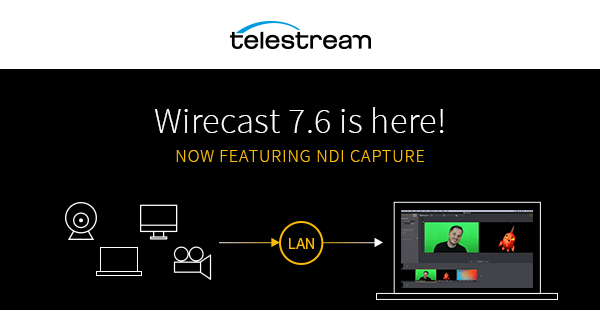 Telestream has released Wirecast 7.6, the newest version of Wirecast. You can upgrade to this version from the Telestream website. Produce your live shows in a whole new way – workgroup production is now possible by using and sharing sources from your entire network. Now it’s easier than ever to bring IP video sources into Wirecast over your local network. Wirecast will now automatically detect and receive any video or audio that is broadcast via Newtek’s high-quality, low-latency NDI protocol. Add high-resolution, live video from cameras, Adobe Creative Cloud apps (such as Adobe Character Animator) graphics (such as NewBlue titles), scoreboards and screen capture sessions, directly into your Wirecast stream. Telestream has announced Version 7 of Wirecast, the leading live streaming and production software. Wirecast 7, which will be available later this month, adds new powerful production capabilities, GPU-accelerated encoding, and a streamlined user interface that allows users to effortlessly create and stream high-quality live broadcasts from their computers to dozens of popular destinations such as Facebook Live and YouTube. Wirecast 7 allows event producers to create the highest quality live-streamed productions, with multi-camera switching, graphics, titles, and live encoding. With the new ISO recording feature, Wirecast Pro can save all original “clean” source camera media allowing an editor to easily repurpose content, free of any overlay graphics from the original broadcast. The new User Interface in Wirecast 7 enables quicker and more flexible access to shot editing features and enhances on-the-fly editing. With the Shot Editor panel, users have more control over every aspect of a broadcast, including the time-saving in-shot source toggles that enable users to turn video and audio layers on and off within each shot for dynamic editing of complex composite shots. Wirecast 7.0 adds more options for how text can be displayed on screen. Text can be entered live, via a file or from an RSS feed enabling a different user to prepare text that will be automatically picked up in the broadcast. A new audio mixer controls every source from one location, and an enhanced “mix minus” feature selectively mutes any source, such as the user’s own voice, while otherwise monitoring full stream audio output. A Global Hotkey Management system speeds up any repetitive task by allowing users to create their own hotkeys. * Graphical Output Statistics – to see the health of the system (CPU/Memory usage) and the output stream (framerate, bitrate, and more). 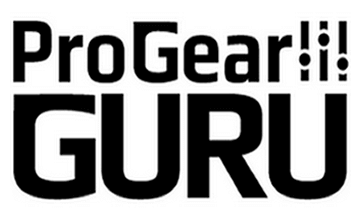 Wirecast 7 will be available at the end of June on the Telestream store and through Telestream’s network of resellers. It will be unveiled to the public for the first time at InfoComm 16 at Magewell Booth N1850 and at the PTZ Optics Booth N2133. It seems like only a matter of time until every possible mode of communication is built into Facebook’s ever-expanding platform. 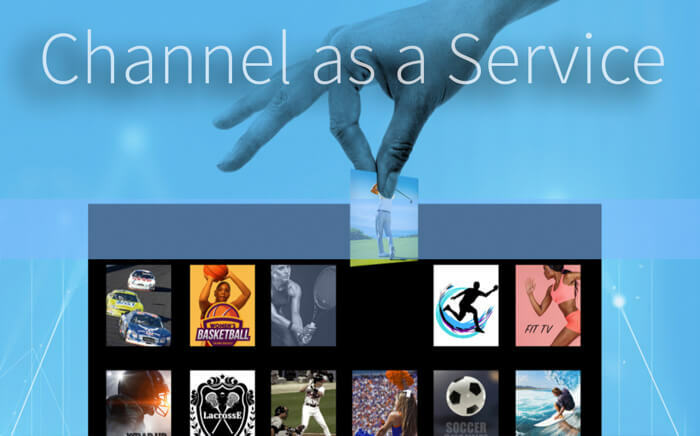 The monolithic social network’s latest frontier to conquer is native video. Last year. Facebook began allowing users to upload longer-form static videos. Now, the company is offering live-streaming video to all users. Time will tell where Facebook will stand against competitors like YouTube in the online video space. Still, more producers are trying out Facebook as a video platform, and that prompted Telestream to update its popular video production suite Wirecast to work with Facebook video. Wirecast users who upgrade to the latest version will be able to take advantage of all of the application’s standard features with Facebook video, including using multiple cameras, text overlays, transitions, and more. There are some Facebook-specific features, too. Wirecast users will be able to log in and send a video stream to Facebook from directly within the Wirecast User Interface. Once a stream is started, users will be able to see the number of live viewers, the names of followers who are watching, and a real-time stream of comments throughout the live broadcast. Once the broadcast is complete, the video will stay on users’ timelines like any other video post. Wirecast 6.0.7 is available now. Learn more about the software with the latest release notes or get general information on Wirecast here. Video products and services provider Telestream will be bringing several new products to this year’s NAB Show in Las Vegas. Lightspeed Live Stream and Lightspeed Live Capture are two new applications that deliver real-time, enterprise-class streaming and capture for media creators. Telestream Cloud is a video encoding SaaS (software as a service) designed to meet the needs of video production and post-production professionals. Lightspeed Live Stream solves the problem of preparing real-time content for adaptive bitrate live streaming while Lightspeed Live Capture can independently record multiple channels of SD, HD, or a single channel of UHD video. Both applications can operate stand-alone on Telestream’s Lightspeed Live server but the greatest benefits are realized when coupled with Telestream’s Vantage platform for complete workflow orchestration. Users can concurrently stream, capture and process live content for consumption on a wide variety of platforms. Telestream’s Cloud service offers high quality video transcoding for all formats and codecs, and dynamically scales in response to customer needs. The service utilizes an easy yet powerful API to automate and integrate workflows. File transfer and encoding times can be optimized from any location since Telestream Cloud uses multiple cloud service providers including Google Cloud, Amazon Web Services and Rackspace. Telestream Cloud features certified ProRes presets to deliver high-quality video files that conform to Apple standards and ensures trouble free post-production on Apple’s Final Cut Pro platform, as well as other popular editing software packages. Telestream will be demonstrating all of its new products and services at booth SL 4525 during NAB 2016.